Learn the basics of chain maille with author and chain maille expert Lauren Andersen! 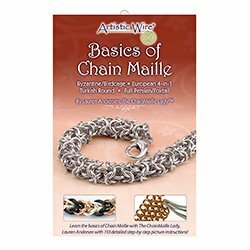 YouÃ¢â‚¬â„¢ll learn essential techniques and weave patterns that are the basis of chain maille. The four patterns covered in this booklet are Byzantine/Birdcage, European 4-in-1, Turkish Round, and Full Persian/Foxtail.